On opening up a whole new dimension with this unorthodox history of the legendary classical musicians. 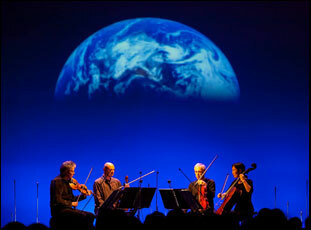 At one point in “A Thousand Thoughts,” Sam Green mentions tongue firmly in cheek that he and co-director Joe Bini have made an “unauthorized biography” of the Kronos Quartet, which is true to the degree that the legendary musicians didn’t have final cut on the project that covers their four-decade career innovating classical music. Of course, you do suspect that they might not be sitting on stage performing a live score for the live cinema event if they had any strong concerns. In fact, Green’s playful approach both as a director and emcee for “A Thousand Thoughts” is more truthful to the group than any more serious treatment ever could be, as is its unorthodox presentation, echoing the curiosity and slight mischief that Kronos has drawn upon to push the form forward, doing the same for cinema in the process. It’s a format that Green has been experimenting with for some time now after showing his mastery over a more traditional documentary with the Oscar-nominated “The Weather Underground” in 2002, leaving him wanting to do something a little radical with nonfiction. 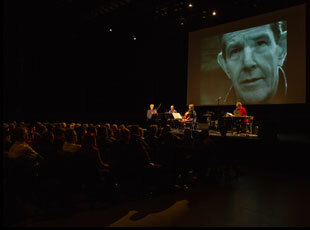 After opening up a whole different relationship with the audience by introducing both himself and live music into the mix for his 2010 film “Utopia in Four Movements,” and subsequently enlisting Yo La Tengo to play along for “The Love Song of Buckminster Fuller,” Green cleverly has the Kronos Quartet use as many musical notes as words to tell their story and come together to chase something ineffable about the role of culture putting the world into context. As Green explains in his introduction to “A Thousand Thoughts,” which premiered earlier this year at Sundance and will be making its Los Angeles debut this Friday at the Theater at Ace Hotel, his interest in Kronos was piqued while making a short on the group, inspired by founder and violinist Dave Harrington’s expressed desire to “create a bulletproof piece of music that will prevent harm from happening,” a lofty goal that seems reasonable as they pluck string liable to send one to the heavens. The quartet can be expected to stir the soul with renditions of John Adams’ “Judah to the Ocean” and Terry Riley’s “The Wheel,” but somehow something even more resonant starts to accumulate as Green and Bini tickle the other senses with images and scattered observations by members of the quartet and close collaborators that speak to their storied history but feel immediate and alive. Just as the filmmakers take note of how what goes down in the quartet’s small rehearsal space in the Mission District in San Francisco can ricochet around the world, “A Thousand Thoughts” extends its reach well into the stars, contemplating time and space in relation to the Quartet’s relatively short time making music together while crafting one perfect, immersive moment for audiences. Before “A Thousand Thoughts” is performed in Los Angeles en route to more dates in 2019 and beyond, Green spoke about the excitement of creating something in which the end result is at least slightly different every time, doing justice to a group known for their inventiveness and taking on a role of host in addition to filmmaker. Janet Cowperthwaite, the manager of the Kronos Quartet, got in touch with me probably four years ago to make a short film about Kronos for their 40th anniversary concert at Carnegie Hall. I didn’t know a lot about who they were and I hadn’t had a lot of experience with classical music, but I really liked the culture of excellence around it and precision, so I said, “Sure.” And I listened to all their music and went to their office and I was just completely smitten with them on a number of levels. They had been around 40-plus years and they’re still vital and experimental and still trying new things, like this weird documentary. [laughs] That really inspired me because a lot of artists get to that point and they’re doing their greatest hits or going through the motions, so I liked that and [after the short] was trying to figure out if I could do something longer. I had the idea of doing this as a live cinema piece where the music could be the heart of it. There’s so many bad versions of this as a traditional documentary because it’s all about the story of the group and then there’s little bits of music, so this seemed like the right form for it, and to my surprise, they were up for it. Since this certainly isn’t that dry historical recounting of the group’s history, was there something you were doing in the interviews to get the group to talk about things in a more experiential way? Yeah, we’ve seen so many “Behind the Musics” and that kind of documentary so much you know what it’s going to be like, so there were a lot of things I was trying to avoid. We interviewed different people who had a connection to Kronos, but there’s nobody who’s an expert or an academic. It’s all people who are organically part of this story and [when] you do a wide-ranging interview, you figure out what’s the best material. With Terry Riley, for example, when he talked about the sound of the wind in the pine trees and how he’d want to choose his death — he’d want to go lie on a hill and listen to that — that was the best part, so in a way, the film is about more than them. It’s using their story to create a meditation on bigger ideas. A historical recounting of the history of Kronos would be pretty straightforward to do, but the big artistic challenge of this piece was to make something bigger than them, trying to make a larger meditation of ideas about time and the mysterious nature of music and the power of art to change the world. Still, it must’ve been so much fun digging through the Kronos Quartet’s archives – was there anything you found in there that changed your ideas of what this could be? I love archives in general and for many years, [the Kronos Quartet] had a clipping service that would cut out newspaper articles about them and what really struck me, and I’ve said this in the film is that looking at those newspaper articles from the early ‘80s, I was amazed at how radical it was for a string quartet to wear New Wave sunglasses or leather jackets. People were shocked by that. Now, it’s the kind of thing where nobody would ever think twice about it. You see that all the time at BAM or at Royce Hall, but at the time, they shook up and transcended the classical world. They were like the Muhammad Ali of classical music. People who had no idea about classical music tuned in, and you can only really sense something like that by going through something like newspaper clippings, seeing it in real time through the eyes of people in that moment. It changed the way I thought about them and gave me a much bigger appreciation because now they play all over and people know the Kronos Quartet, but I think younger people have no sense that they helped create the musical landscape we have today. How did you join forces with Joe Bini? I met Joe at a Sundance event a couple years ago [where] he spoke about film and I loved his ideas. I’d been a big fan of his work with Herzog over the years, “Grizzly Man”’s one of my all-time favorite films, and we became friends. At some point, one of us said, “We should work together some time,” and midway through this Kronos piece, I said, “Hey, would you want to do something like this?” He was intrigued by the idea I think of working in this form [of live cinema], which is really traditional editing, plus this whole other dimension. You’re working with the room and the stage, so it’s not just the screen. It’s like playing 4D chess. The piece is what it is because of both of us and without Joe, I would not have made anything nearly this magical. Can you actually start with the music? Figuring out what pieces you might want first and then seek out images to go with it? That’s actually what we did. We built the [film] around 12 or so pieces of music tied to the story of Kronos. “Black Angels” for example, is this important piece of music for them because David Harrington heard it on the radio and formed a quartet to play that piece, so I knew that that would have to be in there. There would have to be something by Phillip Glass. There would have to be a Terry Riley piece. I heard them play [the Ervin T. Rouse bluegrass ditty] “Orange Blossom Special” and I knew that should be the end, so the piece is really built around these pieces of music and we went from there, which is a really neat way to work. It’s not how you’d normally make a music documentary. I loved the way the silences play and when you move from what’s filmed to what’s live – is getting the rhythm right something different in live cinema? It’s funny because you can’t know how things work when you’re doing something like this until you experience it with an audience, which is hard. With a normal movie, you can do a rough cut screening for three people. You can have a good sense of what you’ve got before you show it. This was much scarier because until we showed it at Sundance, we had no idea. Was it too long? Was it confusing? Was it redundant? How would the last note work? Who knows? [laughs] So we did it and it really worked. It was a great surprise, but it was a total surprise. I understand there were two different sessions with Kronos in preparing that presentation – did anything change as a result of bringing them into the process in that way? We did a little weeklong residency at MASS MoCA and then we did another week at the Exploratorium in San Francisco and that was super-helpful because we did do a little show at the end of each for a small audience. That was a big help, and we made some small changes, just making things clearer. I had compared Janet the manager to Sharon Osbourne in an earlier draft and she said, “Then Kronos would be Ozzy Osbourne.” [laughs] So I changed it to Vladimir Nabokov. When you make documentary films, you make it and the subjects show up at the premiere and that’s it. You don’t involve them at all in the process and it makes it a lot easier if they say, “Oh, my hair looks bad in this shot.” But because this is a live piece, they’re part of it, they’re on stage, it had to be more collaborative. In your role as a host to this experience, what was that like figuring out what your presence in the film will be? It’s funny because I’m a documentary filmmaker and I’ve been making these kinds of live cinema pieces for eight years now, and sometimes people ask me, “What does it feel like to be a performer?” And I still don’t really feel like that. I’m basically playing a character, which is myself and just get up there and talk as I’d normally talk. I’m not somebody who could be an actor or could play other characters. I could play one character and it’s me, the filmmaker, so that’s kind of it. [laughs] I do get nervous beforehand, but once it starts, it’s fine. And I actually really enjoy it. It’s a thrill to be up in front of a big crowd and anyone who’s a performer knows this, but it was news to me, I said to someone who’s a performer, “Did you know when you’re up there you can feel the energy of the crowd?” And they were like, “Duh. That’s Performance 101.” [laughs] But I was learning all this stuff and it was striking because you can have this very deep relationship with the audience that goes back and forth. What’s it been like to travel with it? It’s great. Other filmmakers [have said to me], “What? It only exists when you are there? You mean you’ve got to travel all over with it? What a bummer.” But to me, it’s the opposite. I really love the part of a project where you take it out into the world and screen it in front of people and this really just amplifies that. It only really exists when we screen the film. It’s not on Netflix. It’s not on YouTube. It’s not on Amazon. The only way to experience it is really to be there and no two shows are the same. It only exists in the memories of people who have seen it and we are booking shows way in advance – Kronos does that. We [already] have shows for 2021 and I’m happy to keep doing this for as long as anybody wants to see it. “A Thousand Thoughts” will next screen in Los Angeles at the Theater at the Ace Hotel on December 7th at 8 pm. A full schedule of upcoming shows with cities and dates is here. Interview: Khalik Allah on Capturing a Family Portrait of a Nation with "Black Mother"